It seems to trouble many people that Obama doesn't wear a flag pin. Or that his preacher has made inflammatory remarks. It doesn't matter, apparently, that Obama himself says nothing of the sort. But no one seems to mind that John McCain "hates gooks." Or that he says he'll hate them as long as he lives. And no one seems to mention this even as we're told ad nauseum about this preacher. Now I understand that Mr. McCain had awful experiences as a POW in Vietnam. But personally, I see no place in the White House (or in a school, for that matter) for a person who throws about racial epithets with no apparent knowledge of their implications. Now, perhaps Mr. McCain only hates some "gooks" and not others. Or perhaps he feels the bad ones spoil it for the good ones. I don't really know. But I do know that's the same old garden-variety nonsense that garden-variety racists have been serving up for years. 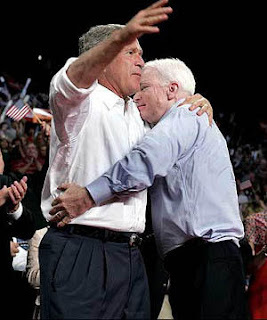 And even if we disregard Mr. McCain's vows to carry on the unconscionable policies of G.W. Bush, someone who aspires to the presidency ought to know precisely what the implications of his words are, not sometimes, but every single moment.